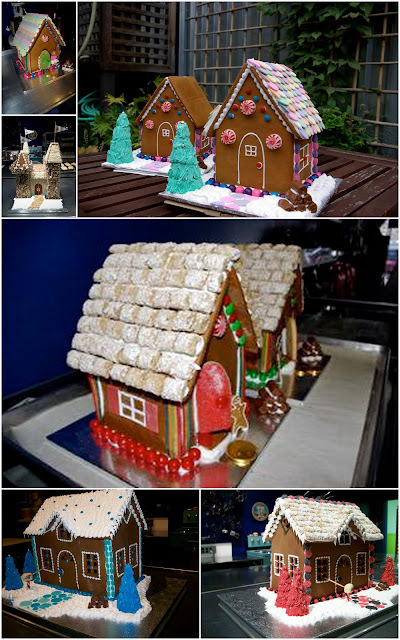 The Queen of Tarts: Gingerbread Houses!!! I thought that I'd share a random sampling of our gingerbread houses. Some were corporate custom orders, some done for a Canadian Tire Christmas commercial, and the castle was commissioned by the California Almond Growers Association for a media event. It was decorated entirely with almonds, 9 different kinds! Gingerbread houses are so much fun to decorate - one of our most popular items this time of year is our gingerbread house kit. It contains all the pieces, meringue powder, and enough candy for the house and to keep you going while decorating.